The 1967 Chevrolet Corvette L88 is one of the most sought after Corvettes by serious Corvette collectors. It is also one of the rarest. Only 20 L88 Vettes rolled off the assembly line for the 1967 model year. That statistic alone puts it in a class all by itself. This example is the only known Sunfire Yellow example in existence. Pop open the hood and see the 430 horsepower 427 that powers this beast. This L88 also retains its original trim tag, new car sales contract, and title. Even vintage photos of the car with its original owner come with the car. In its early years, this car served as a daily driver and drag racer in California and Kansas. After a towing incident in 1969, the car was hidden away in a barn for 15 years. It was eventually sold to a new owner who spent a decade restoring the car. It found new ownership in 1989 where it remained for almost 20 years. It’s speculated this car will bring between $1,250,000 to $1,750,000. In recent years, other 1967 Corvette L88s have sold close to $4,000,000. With that in mind, this car’s bidding estimate seems in the low range. 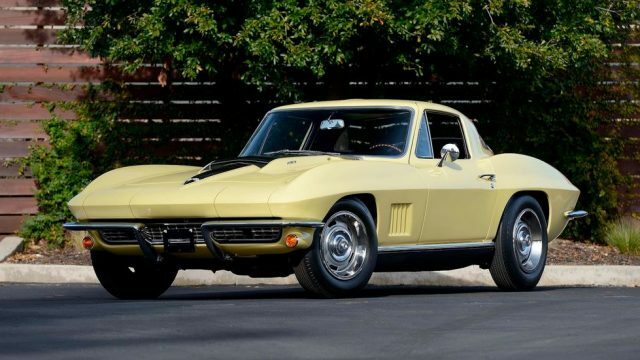 See this L88 Corvette cross the block later this month during Mecum’s Indianapolis 2018 auction. For more information, check out http://mecum.com.